Since Jeffro Johnson renewed interest in Dungeons & Dragons' Appendix N as an indispensable source for understanding both gaming and fantasy, there has been an on-and-off search for similar lists for those of us more inclined to spacesuits and rayguns instead of armor and swords. The most likely source, the Traveller RPG, was not as forthcoming about its influences as its fantasy kin. This leaves those attempting to find a historical list of science fiction classics searching outside of gaming for a sense of what fans thought classic. Certainly, today's best-of lists are more an indication of which of the fractured science fictions is the favorite of the list compiler. Dune and Foundation may make most lists, but whether John Scalzi, John Ringo, or Yoshiki Tanaka appear tends to depend on who knows who and what particular sub-culture is making the list. And with the incredible explosion of science fiction titles in the last decades, coming to a consensus grows ever more daunting. But there was a time when the field was much smaller, and an established consensus of the important works of science fiction was agreed upon. 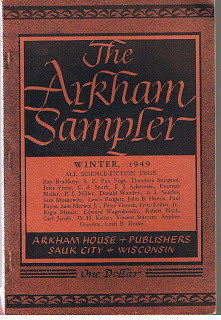 For that, we must turn to the third science fiction boom, to winter 1949, and the Arkham Sampler. A group of editor, writers, and fans were each asked for up to twenty titles essential to a science fiction library and why. While issues and reprints of that Arkham Sampler are prohibitively expensive, the list itself continues to be passed down. The writers included Dr. David H. Keller, P. Schuyler Miller, Theodore Sturgeon, A. E. Van Vogt, Donald Wandrei, and Lewis Padgett--better known as the husband and wife team of Henry Kuttner and Catherine L. Moore. Rounding out the list were the fans. A. Langley Searles is "best known for the scholarly science fiction fanzine Fantasy Commentator." Forest Ackerman was the literary agent for many of the authors listed above as well as the father of convention cosplay. And Sam Moskowitz was a noted historian of science fiction fandom and a fervent opponent of the Futurians. Seven Famous Novels by H G Wells. This collection includes The Time Machine, The Island of Dr. Moreau, The Invisible Man, The War of the Worlds, The First Men in the Moon, In the Days of the Comet, and The Food Of The Gods. Who Goes There? : Seven Tales of Science-Fiction by John W. Campbell, Jr. Readers looking for the contributions of Isaac Asimov, Robert Heinlein, and most of the authors on this list will find their short stories in Adventures in Time and Space, the collection which fueled the third science fiction boom of the late 1940s. Adventures provides an overview of the Campbelline Revolution, to which The Best of Science Fiction adds insight to pre-Cambelline classic writers, including Edgar Alan Poe and a host of 1920s and 1930s pulpsters. Derleth's Strange Ports of Call adds Ray Bradbury, Fritz Leiber, H. P. Lovecraft, and Lord Dunsany to the list of required science fiction writers. But the Big Three of this time are H. G. Wells, Olaf Stapledon, and, once all three anthologies are examined, A. E. van Vogt--with John Campbell nipping at his heels. Within fifteen years, many more classics would be written, prompting many additions to the basic science fiction library, which we will investigate at a later time.